Exina Silence, short for Silence is a Microsoft Internet Explorer plugin. Silence can block popup IE window, and wipe off floating ad. Be annoyed with floating Ad. images in IE? Why not try Exina Silence? Exina Silence is a standard IE pulgin, which can ERASE floating Ad. easily, you just need move your mouse pointer over the floating Ad image to remove it. 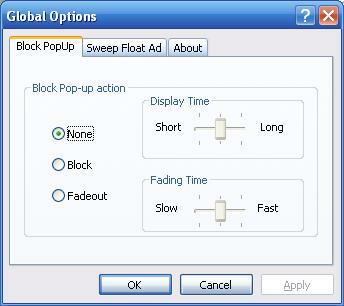 Exina Silence is not only a floating eraser, it also can FADEOUT unauthorized pop-up IE window. Fading out window make you would not miss anything popped up, and it will not interrept you since popped window will disappear. I developed this plugin because I often meet unauthorized popup window and floating picture ad when I browse website with IE, I tried to find a good solution to stop this happen in google, unfortuntely I failed. No utility/tool/plugin match my demand. In this regard I tried to write programm to resovle it myself, after 3 months' work Exina Silence worked out! I call it Silence means it can make my IE Silence, no more disgusted Ad popup window, no more anywhere floating Ad disturbance. Some day I recognize many people suffer the same pain Silence is maybe helpful for other pepole, I would like to share this great IE plugin with anyone, it's small but usful. I know Silence is not good enough, I hope you can give me your suggestion, your suggestion/comment/bug report can help me make Silence better.